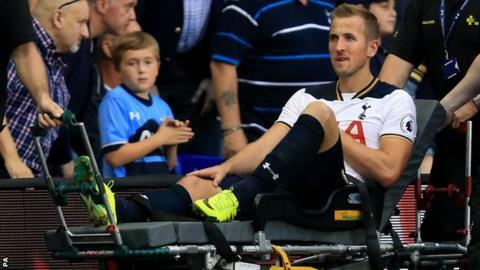 Tottenham hope to learn the full extent of Harry Kane's ankle injury on Monday after the striker left Sunday's win over Sunderland on crutches. Kane, 23, scored the only goal of the game at White Hart Lane before twisting his ankle while tackling Papy Djilobodji late in the match. "We need to know about the injury and wait until tomorrow," Spurs boss Mauricio Pochettino told BBC Sport. Kane's 59th-minute goal was his second in as many Premier League games. Midfielder Mousa Dembele, making his first start of the season, and defender Eric Dier also went off with injuries. But Pochettino said the pair's problems "are not a big issue - just cramps".